The Danish Superleague hits the final few rounds and cold conditions mean that there will be some tightly-contested action with teams aiming to achieve their varying objectives. We've taken a multiple bet on the action spanning Sunday and Monday on betPawa and if all results go our way, we will convert a Ksh20 bet into a Ksh395 win! AaB are in the hunt for a top-six finish but have struggled at home, winning only two out of nine matches there.. The reverse fixture ended 2-2 in Randers, but AaB could just edge this one. FC Nordsjaelland young team has had its ups and downs this season, but they've solidified their defence, and drawn four of five training matches during the winter. Visitors Brondby is challenging for a top six finish but their one-dimensional playing style means that they aren't the most enterprising side. These sides could well cancel each other out here. Copenhagen is miles ahead of the nearest challengers in the Superleague in Denmark, and they are heavy favourites to win another title as they approach the spring, after a strong recruitment period where they bought in some quality players. OB has a talented coach but they lack the firepower to trouble Copenhagen here. 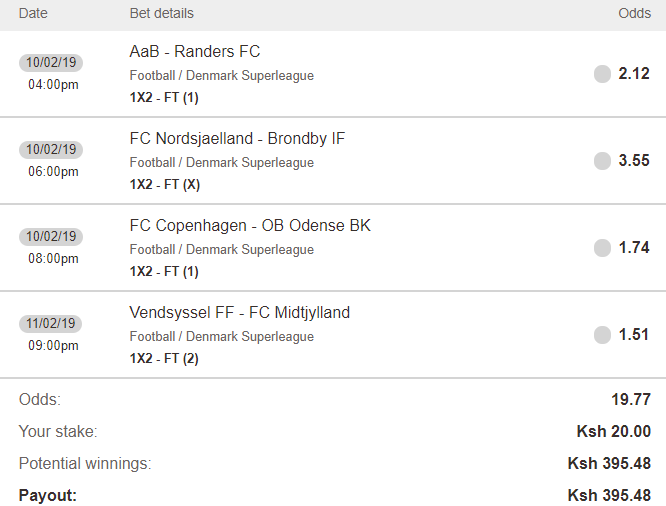 Vendsyssel simply wants to survive in the Superleague, while Midtjylland is gunning for a second consecutive title win. They managed to hold on to target man Paul Onuachu despite keen interest from other clubs for his signature in January. The visitors have to win here to keep pace with Copenhagen in the title race, and we think they will do that.